My gig at Citysearch means searching this city for only the latest and greatest spots, and though I try to not focus on Manhattan and Brooklyn, it's so hard! Especially when great places like Lincoln Station are opening up! The folks behind al di là and Bar Corvo have brought south Crown Heights a bit of their culinary genius. Lincoln Station is perfect for breakfast, lunch, afternoon coffee, and dinner take-out. I'm serious. I stopped by for a little lunch time work--free Wifi is always a plus in my book--and picked up their rotisserie lamb sandwich. 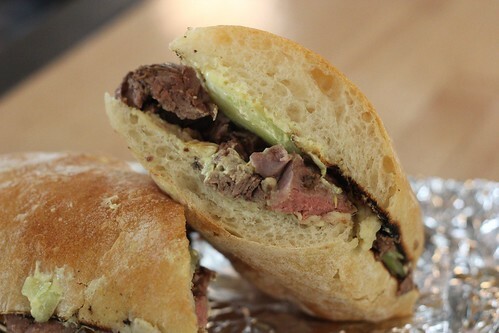 Succulent slices of lamb sandwiched between ciabatta with cucumber, fava bean puree, and a spicy yogurt sauce adding a Mediterranean flavor. The kicker? It's under $10. I desperately need to get back to try the tripe Sloppy Joe. Genius!